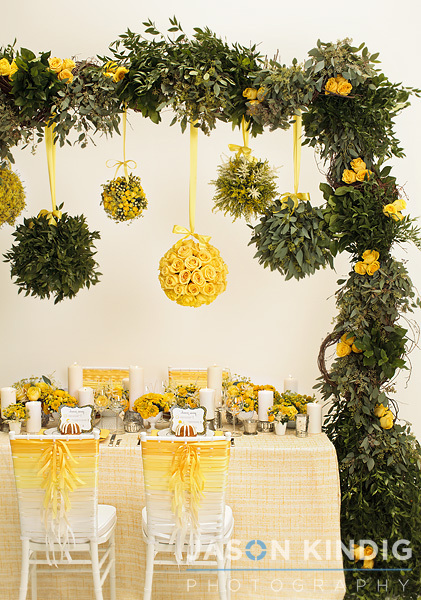 Yellow is such a happy hue, which makes it the perfect fit for your wedding colours. There are so many shades of this sunny sweetheart to choose from — mod neon to golden lovelies! It’s FRESH! Get inspired by all the brightness and cheerfulness of the following real wedding inspirations. The pic above is one example of a head-to-toe yellow affair. Wow, look at those ombre chair ribbons — so very pretty. And the hanging ball of yellow flowers? Just stop it already with the cuteness. Yay for summer weddings! 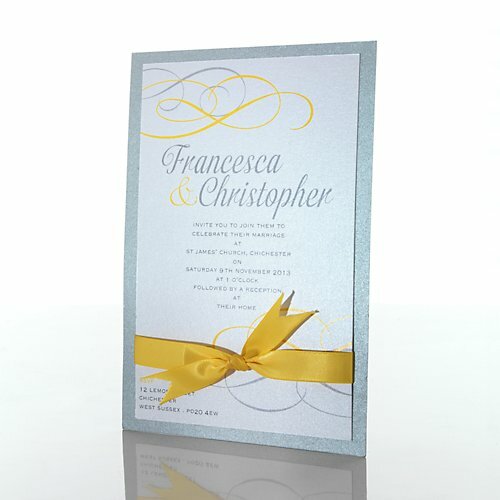 This adorbs Flourish Day Invitation by Mandalay in yellow, grey and white is just right for your day of celebration with its lovely swirls and shimmering backing. It’s such a versatile style, and can be used for a garden-party wedding or a fancy estate affair! We are in love with this beautiful little bundle of joy. 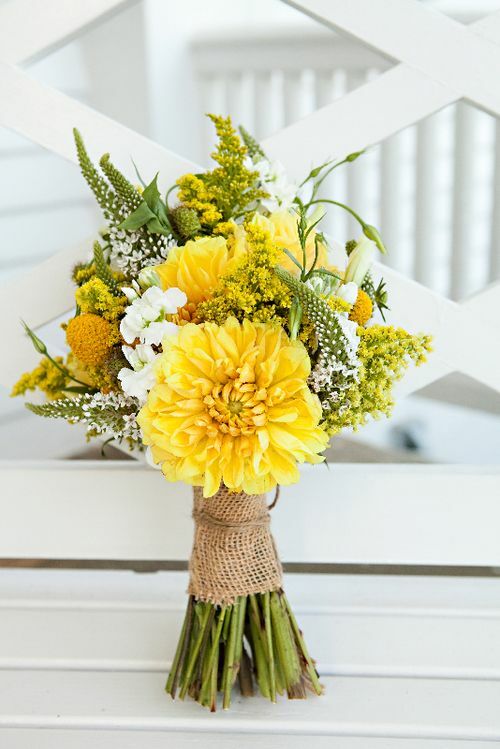 The bouquet is filled with yellow flowers with white and green accents and secured with a burlap ribbon — how fitting for this de-constructed arrangement that looks like it was plucked from a sea of wildflowers on the farm (in a very, very chic way!). 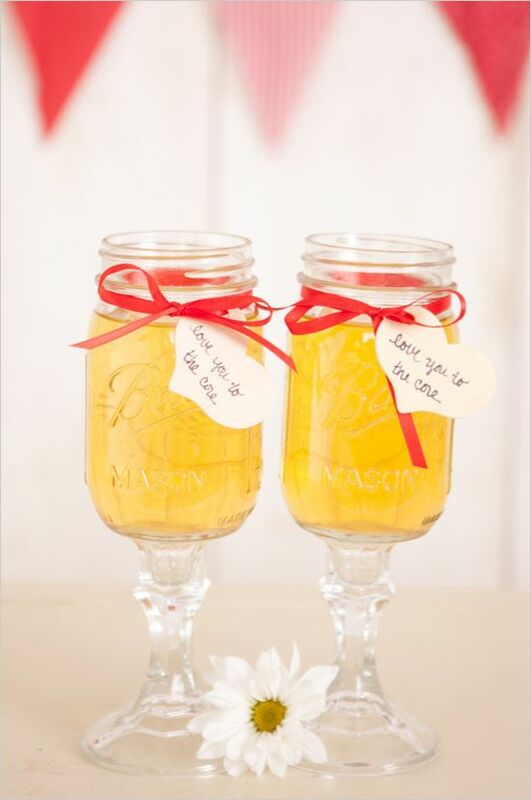 So, you can go two ways with incorporating the not-so-mellow yellow into your bridesmaids’ attire. You can go the pretty yellow dress route, or you can go the pop-of-colour accessories route, displayed here and nicely paired with grey (one of the BEST hues for yellow because of its nice contrast). 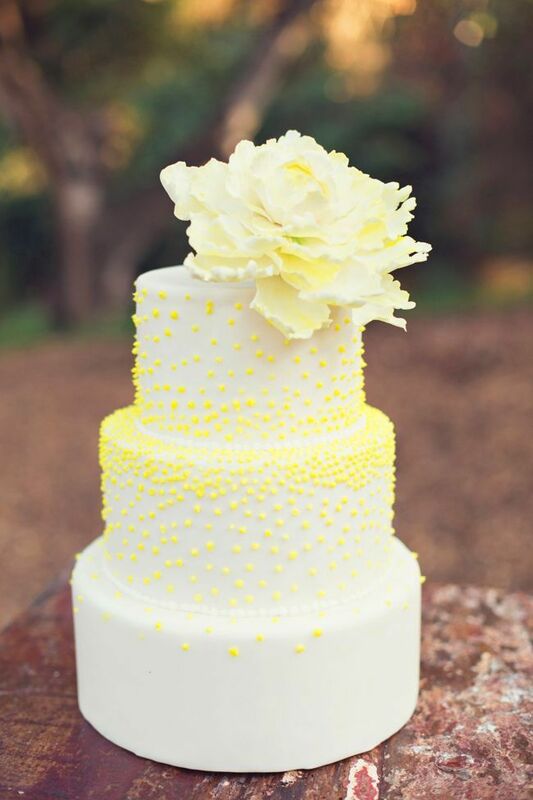 Fabulous little yellow ones…all over this fabulous little cake. And doesn’t that flower look REAL? Cake perfection. We hope someone ate that sugary goodness on top. Fun idea (if you like lemon): you could do a lemon sponge cake inside. Mmm mmm good. Love this idea! Why not bring the drinkies into it, too? You can choose to do so with a non-alcoholic bevvie like this one, or you can make signature cocktails with lemonade. Delish! Sa-weeeet! What does every guest like? A favour they can munch on after your big day is over. 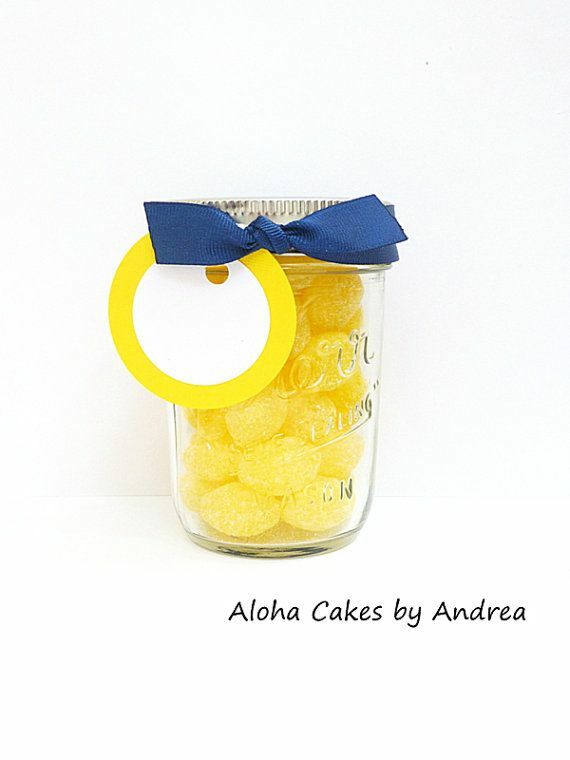 The perfect package: lemon candies in a jar with a contrasting favour ribbon. Find out about how we can help you with all of the Finishing Touches and personalisation needs for your wedding. If you haven’t decided on which stationary to use for your yellow inspired wedding, the best place to start is with our incredible range of affordable yet luxurious wedding invites.